The shared vision of the EarthConnections Alliance is "a world in which all students in our country can travel along educational pathways toward meaningful careers while linking geoscience learning with opportunities to serve their local community." The EarthConnections Alliance brings together scientists, educators, and community leaders the create locally contextualized pathways for students that emphasize connections between science and community. ensure mentoring and signposting that supports students. The EarthConnections pathways are rooted in existing regional activities and developed using a process that engages regional stakeholders and community members. Regional Alliances draw upon the assets and expertise of the Program Partners to build and enhance these pathways. The pathways connect, sequence, and create diverse learning opportunities that link geoscience education and community service to address local geoscience issues and challenges. Activities led by the backbone organization and program partners guide Regional Alliances through the work of establishing a regional alliance, mapping existing assets, developing a strategic pathways vision, and creating and improving pathways. Through continuous communication and structured processes the Regional Alliances have access to the evolving pathway maps of other alliances, written descriptions of their alliance and its activities, and shared metrics allowing them to identify sources of relevant experience within other Regional Alliances. Similarly, Program Partner information including descriptions of their programming and case stories documenting the use of their programs, resources, and expertise in specific Regional Alliances will support identification of needed expertise. The Oklahoma Alliance started by working with local stakeholders to identify existing programs where geoscience information and activities might be added or strengthened. They then working to connect those programs with potential resources from the National Alliance and Program Partners, as well as other potential local partners. The San Bernardino Alliance began by thinking about the types of people and institutions that are involved in geoscience in the region and are interested in promoting the development of a diverse workforce. The alliance took advantage of existing relationships to form our initial core of alliance members and expanded there pathways from there. 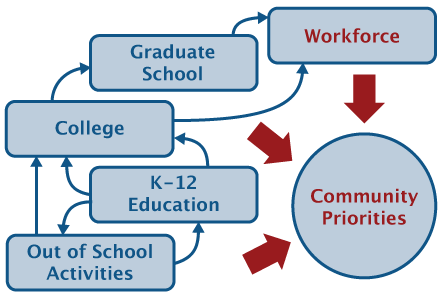 The Atlanta Alliance embedded themselves within local community organizations and institutions to generate critical support for building and maintaining pathways connections within the community. These resources are augmented and enhanced through collaborations with program partners. For example, the San Bernardino Alliance used the InTeGrate/NAGT traveling workshop program to bring together educators from multiple levels within their pathway to discuss effective ways to link geoscience learning to societal issues. They are now considering using the InTeGrate Map Your Hazards module at multiple points in the pathway. The Oklahoma Alliance is making use of IRIS teaching resources while the Atlanta Alliance is collaborating with UNAVCO to design an undergraduate research program.